« What Happened to E-town Water? 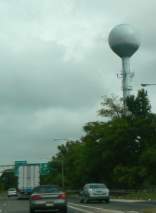 Shown is a view of the World’s Tallest Water Sphere as you speed eastward towards New York City along Route 22 East. You better hurry because the cars are traveling about 80 miles per hour and there are some tricky merges from Morris Avenue (Route 82), the Garden State Parkway, and Route 78 here. Notice the two tone scheme of the tower. Light gray blue on top to match the light cloud cover. Darker gray blue on the bottom. This is reminiscent of the Navy blimp camouflage schemes used during the Great War. This entry was posted on Saturday, December 22nd, 2007 at 8:01 am	and is filed under Photos. You can follow any responses to this entry through the RSS 2.0 feed. Both comments and pings are currently closed.